First, The Erbeth Transmissions is anything but typical. Erbeth, seems to be another name for what is commonly called LifeForce, Chi, and also known by many other names. This story is a unique Science-Fiction that takes a lot of esoteric, mystic, religious, philosophical, theological, occult, gnostic, and metaphysical concepts and portrays them as Fritz’s version of the true history and nature of mankind and his relation to celestial beings in the universe. You will find accounts relating to ancient colonization of Mars in man’s prehistory as well as mention of such things as Nibiru, the 12th Planet, the Reptilian Agenda, Luciferianism and the true meaning of the Legend of the Fall, and many many more conceptual ideas. This book is a MUST for any fan of Asmodeus X as it helps to explain the many terms, phrases, and concepts behind the band and music, especially as it relates to date to the albums Morningstar and Sanctuary. For anyone who is not well versed in esoteric philosophy, this book may just seems like a very interesting fiction read. For for those who are, you may note some, at times, rather profound, conceptual ideas and conceptions and unique linkages to varous philosophical ideas. It is both amusingly humorous as well as thoroughly though provoking. It is the type of book that is both a quick read and also a lot to take in. I can’t imagine how much for someone who is not versed in esoterica. However, it is the also the type of book you will want to read over again and could also be the cause of some very interesting new cults. On the level with the best works by Robert Anton Wilson and his associates but is definitely a new breed of further thinking. I can only think of about a handful of authors out of the hundreds of books I’ve read that I have found their works hard to put down and this is definitely one of them! Jammin' today. Getting it together for the August gig which gonna seriously rock. Moving into the future and embracing our roots at the same time. And diggin' some old-school Schlitz by the by. Hope to see all our homies out on 8/29 for KFK! Check it out! It's such an honor to be playing with KFK - big-time early influence for us! Just finished remix for Ex-Voto song Watch Out, which should appear on a rmx album to accompany the new Ex-VoTo Cd Antioc! It was so much fun, I love chopping-up guitar tracks and maximizing the 'chuckity-chuck' goodness of it all. Also reminded me of some of the good times we all had during Ex-Voto's post-Katrina Houston residency. Really looking forward to this release! Visit http://www.myspace.com/exvoto to stay up to date on the release of Antioc! 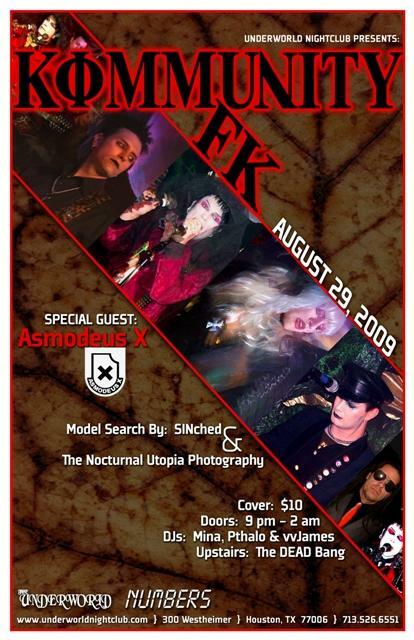 Club Hell MyspacePaul Fredric will be appearing on stage with with good friends and dark electronica associates Phase Theory, June 24th, 09. Come on and check it out if you're in the neighborhood! Four years ago, after I got hit by a car while walking accross the street, I started having wierd impressions and ideas. I began to write them down. Gradually they began to form a story. Some of these themes began crossing over into the music I was working on at the time, which happened to be stuff like Astaroth, Typhoon, Spaceship with Beelzebub and other Sanctuary tracks. Eventually the ideas all began to form into a (semi) coherent story-line which I came to call The Erbeth Transmissions. I can now say with some degree of confidence that this process is complete. Thanks to everyone who has helped me or been supportive along the way, and you can help now too by spreading the word! GB #27 contains a great write-up on the Gothic Cruise and the great performances by Combichrist, Red Flag, Asmodeus X, and Phase Theory. In stores now, check it out! The popular trip-hoppy track from Sanctuary. The spacey-est Asmo yet! Live footage shot by Allison Skott of Opulent, J-Dogg from Opulent makes a cameo appearance in the end. X-tra special thanks to Allison on this one! Check out the new look at www.asmodeusx.com! With all our videos, music player, and links to all sorts of Asmodeian resources. Special thanks to Marshal for his great work on the website, we are fortunate to have such talent within our circle! Congratulations to Erase the Virus, Dead P.A. Vertigo Blue and all the other artists who won awards! Extra special thanks to Gustavo, GCEMA, and the Revolutions team for all their work and a great event. See you all on the otha-side! P.S. Check out pic in our photos section! CHAIN DLK: Negative Impact Vol 3 Review - Asmodeus X and Phasetheory! live definately a band to catch in all their action. Next is Track 5, "
indeadstrial and let me say each band seems to excel in all catagories. awesome it appears on this compilation and only makes this stronger. " to danse to it's message. Still moving further we move to track 14, "